Rose Blossom Legacies: Here's to You Special and a Workshop! Here's to You Special and a Workshop! 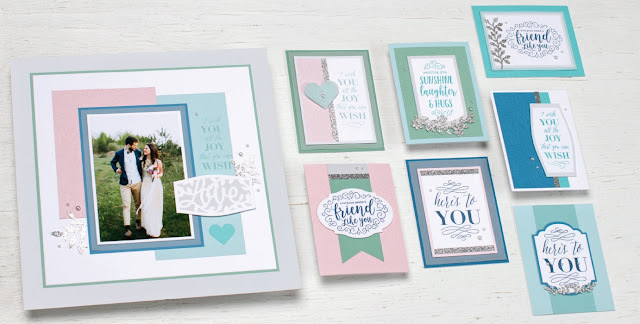 The Here’s to You special features a workshop kit inspired by life’s special occasions! To celebrate these moments, the Here’s to You workshop kit features four exclusive stamp sets designed for making elegant cards and layouts. 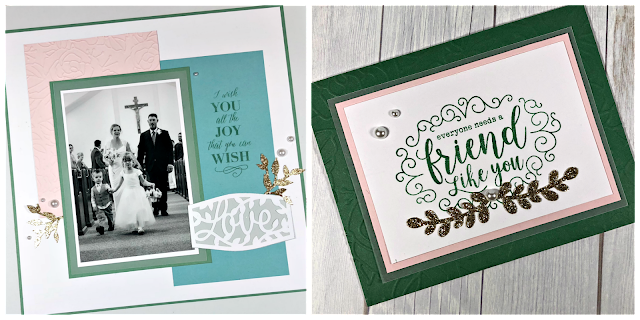 The products in this workshop include four stamp sets and other items to create one 12″ × 12″ page and seven cards that can be used for weddings and many other occasions! Please click HERE to see all that is included in the Here's To You special. I love Juniper and Bashful together. So when I saw this kit, I decided to make it with those two colors with a little Flaxen mixed in. Here are the results! Click on the photos to make them larger so that you can see the beautiful dry embossing with the rose folder. Let me know if you'd like this kit and would like some custom colors. I would surely be happy to put a kit together with the cardstock colors you would like to work with! You can e-mail me HERE. I'd be happy to hear from you!